TYPE: This field refers to the datatype of the values that the attribute will contain. VALUE_TYPE: Defines if the default is a constant or a reference to an item attribute. This table used to track values contained in activity attributes. This table is identical in purpose to wf_item_attribute_values except it holds values for activity attributes instead of item attributes. Each row includes the process activity id and the associated value for the attribute. The interesting thing about this table is that it uses the process_activity_id to identify the activity to which the attribute is attached. The same activity can be inserted into a process more than one time, so the only way to uniquely identify the node to which this attribute is attached is to use the process_activity_id. The messages that are associated with notifications are stored in this table. Each message, which is uniquely identified by the combination of item_type and message_name (stored in the fields “type” and “name”) receives a single record in the wf_messages table. The actual text of the message is stored only in its localization table (wf_messages_tl). They can found in the “body” and “html_body” fields. This table contains message attribute definitions. Each message may have zero or more message attributes. Message attributes define additional information that is to be sent to, or received from the user. These attributes can be used as tokens in the subject or body of a message template to place variables values into the message at runtime. A process is a sequence of activities performed in a pre-determined order. When you create a process definition in the Workflow Builder by dragging various notifications and functions into the process window, the records created by the Builder are stored into this table. The flow of a process from node to node as indicated by the transition arrows is not saved in the wf_process_activities table. Instead this information is stored in this table. A transition is defined by three discrete pieces of information: the node where the arrow begins, the node toward which the arrow points, and the result which, when returned by the beginning node, causes the transition to be followed. Not surprisingly, it is those three fields which are the most important fields in this table: “from_process_activity”, “to_process_activity”, and “result_code”. The values stored in “from_process_activity” and “to_process_activity” are numbers which represent the instance_id of the records from wf_process_activities from which and to which the transition is moving. 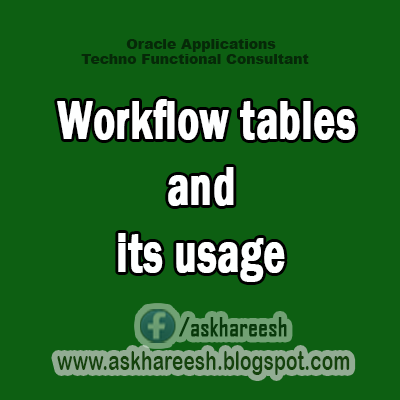 Wf_lookup_types_tl is the table used to set up the types of results expected from Workflow activities like functions and notifications. This table does not contain the actual result values, it holds the groupings of the result_codes – the names you see in the Workflow Builder as the names of the Lookups. Wf_lookups_tl is the table that stores the component values that comprise a lookup_type.